To view a list of marked water bodies, please visit this page. Maine cooperates in a nationwide, uniform waterway marking system. 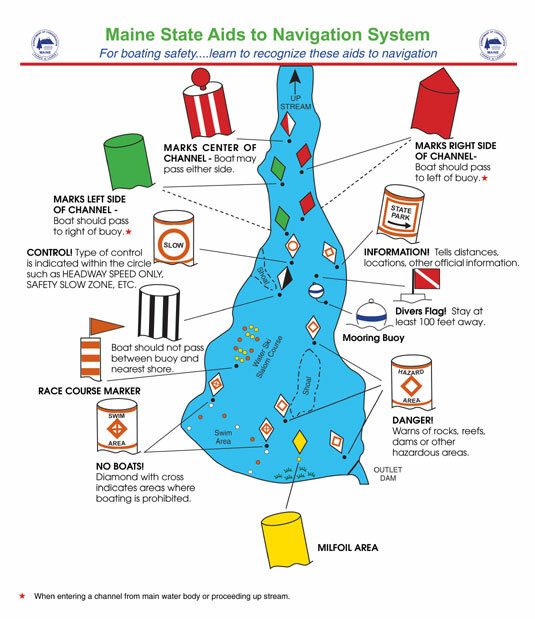 The Maine State Aids To Navigation System is the basic system of waterway markers (buoys) used on State waters as recommended by the U.S. Coast Guard for the purpose of minimizing hazards to navigation. The system is consistent with the International Association of Lighthouse Authorities (IALA) Maritime Buoyage System (Region B) and complies with existing U.S. Coast Guard regulations. No city, county or person may mark the waters of Maine in any manner conflicting with the marking system prescribed by the Director of the Bureau of Parks and Public Lands, Maine Department of Agriculture, Conservation and Forestry. The Bureau can issue a permit to lake associations, municipalities, and other organizations to place and maintain waterway markers. For more information on these permits contact the Navigational Aids Program at (207) 582-5771. Maine's boating law requires all watercraft to carry at least one Coast Guard approved personal flotation device (life vest) per person. All watercraft equipped with motors must be registered in Maine or in a state with which Maine has a reciprocal agreement. The Director, Maine Bureau of Parks and Lands, as authorized by Title12 MRSA, Section 1894, adopts the following Rules and Regulations. The Maine State Aids To Navigation System is the basic system of waterway markers used on state waters as recommended by the U.S. Coast Guard for the purpose of minimizing hazards to navigation. Maine cooperates in this nationwide marking system to insure that these buoys and markers will have the same meaning in all states. The system is consistent with the International Association of Lighthouse Authorities (IALA) Maritime Buoyage System (Region B) and is compatible with existing U.S. Coast Guard regulations. The Director of the Bureau of Parks and Lands shall decide when, in his/her opinion, hazards to navigation exist and mark the waters of the State, within the resources and funds available, by placement of aids to navigation and regulatory markers on the waters consistent with the rules provided in Title 12 MRSA, Section 1894. The Director, Maine Bureau of Parks and Lands, as authorized by Title 12 MRSA, Section 1894, adopts the following Rules and Regulations. AGREEMENT OF ASSISTANCE. A written agreement whereby an organization or political subdivision may assist the State in waterway marking. AID TO NAVIGATION OR AID. A waterway marker placed in, on, or near the water, designed to indicate a channel or the presence of a navigational hazard. BEACON. Any device designed in a fixed manner in the water or adjacent land (structure constructed of pilings, etc. ), which is used to convey a message of Navigational Aid to watercraft operators. BOATING PUBLIC. Those persons who trade and/or travel by passenger craft, yachts, houseboats, fishing boats, motorboats, sail boats, personal watercraft and other watercraft, whether or not operated for hire or profit. BUOY. Any device designed to float, anchored in water and is used to convey a message, the exception being a mooring buoy, which is used to moor a watercraft. BUREAU. The Bureau of Parks and Lands, Maine State Department of Agriculture, Conservation and Forestry. DISPLAY AREA. The area on a buoy or sign used for display of a water marker symbol and /or pertinent boating information. FAIRWAY. A navigable channel in a restricted area of a water body which may or may not be marked with channel markers. FREE NAVIGATION. The right of the boating public to utilize a water body subject only to those restrictions imposed by legal authority. GREAT POND. Any natural body of water ten (10) acres or larger or any artificial body of water thirty (30) acres or larger. MOTORBOAT. Any watercraft, including airmobiles, equipped with propulsion machinery of any type, whether or not the machinery is the principle source of propulsion, is permanently or temporarily attached, or is available for propulsion on the watercraft. NAVIGATION HAZARDS. Any obstructions to navigation submerged in or floating on the waters of the State occurring either naturally or placed in or on the waters by individuals. ORGANIZED SWIM AREA. Any developed swim area, especially those areas developed by summer camps, community organizations and other shoreline owners, which is enclosed by line floats and delineated by at least two "Swim Area" markers at the outer off shore bounds. PERMIT, STATE (Waterway Marking). Written consent of the State, given for the placement and maintenance of navigational aids or regulatory markers. REGULATORY MARKERS. Waterway markers placed in, on, or near the water to indicate or convey: Danger, Restricted or Controlled areas and/or information. SHORELINE. The demarcation between land and water at any specific time. The shoreline will vary as the water elevation fluctuates. SIGN. A device for carrying a message which is attached to another object such as a buoy, beacon structure, post, piling, or the land itself. SKI JUMP, WATER. Structure to allow water skiers to leave the normal water surface, placed on the surface of the waters of the State and anchored to the bottom. SKI SLALOM COURSE, WATER. Buoyed course through which water skiers zigzag. SWIMMING AND DIVING FLOATS. Any floating structure for swimming and/or diving, placed on the surface of the waters of the State and temporarily or permanently anchored to the bottom. SYMBOLS. Figures, geometric in shape, such as a diamond, circle, rectangle, square, or other as deemed necessary, used to convey information. WATERCRAFT. Any type of floating vessel, boat, canoe, or craft used or capable of being used as a means of transportation on water other than a sea plane. WATERS OF THIS STATE. All inland waters and all coastal waters within the jurisdiction of the State of Maine. WATER SAFETY ZONE. That area of water within 200 feet of any shoreline, whether the shoreline of the mainland or of an island. The State does not normally buoy hazards within this zone except when marking a channel or critical, high traffic areas. WATERWAYS. Water, navigable in fact, which, by itself, or by uniting with other waters, navigable in fact, forms a waterway on which watercraft may travel. WATERWAY MARKER. Any device designed to be placed in, on, or near waters of this State, to convey an official message to a watercraft operator on matters which may affect health, safety or well-being. The Director of the Bureau of Parks and Lands may make rules for the uniform marking of the water areas of this State not otherwise regulated, through the placement of aids to navigation and regulatory markers. No city, county or person shall mark the waters of this State in any manner conflicting with the marking system prescribed by the Director of the Bureau of Parks and Lands. Whoever violates any of the rules and regulations or any notices posted by the Bureau of Parks and Lands at public boat launch facilities, or who willfully mutilates, defaces or destroys any notice, monument or marker lawfully erected within or adjoining the borders of these public facilities shall be guilty of a Class E. Crime. Whoever marks waters contrary to the rules established by the Director of the Bureau of Parks and Lands shall be guilty of a Class E crime. Whoever moors a watercraft to any buoy, beacon or permanent structure placed by the State or any organization authorized to place markers by permit in waters of this State, or in any manner makes fast thereto, shall be guilty of a Class E crime. Whoever intentionally destroys, defaces, damages, moves off station or sinks any buoy, beacon or marking device either floating on the waters of the State or permanently fixed to the land or structures adjacent to the water areas of the State, placed by the State, or any organization authorized to place markers by permit, shall be guilty of a Class E crime. The District Court and the Superior Court shall have concurrent jurisdiction in all prosecutions under any provision of this chapter. Any person arrested as a violator of said chapter may be taken before the District Court in the division where the offense was committed, or in any adjoining division. Jurisdiction in such cases is granted to the District Court to be exercised in the same manner as if the offense had been committed in that division. The Maine State Aids To Navigation System (M.S.A.T.N.S.) has been developed to guide the watercraft operators on waters of this State. 5. Other waterway Marking Devices and Waterborne Structures. 1. Lateral type aids to navigation mark defined channels. They define the port and starboard sides of a route to be followed and their most frequent use is to mark the sides of a channel. The coloring and numbering of Lateral aids are determined by their position with respect to the navigable channel, as such channels are entered and followed upstream or toward the head of navigation. There are two (2) distinctively colored aids used to indicate the sides of a channel. a. Solid Colored GREEN Aids (All Green Can) shall indicate that side of a channel to be kept to the left (port side) of a watercraft when proceeding upstream or returning from the main water body. Go between all-green aid and a companion all-red aid. The green aid is used together with the all-red aid to mark the entrance of a channel. While traversing the remainder of said channel, all-green aids shall be kept on the same side of the watercraft as indicated by placement of aids at the entrance to the channel. b. Solid Colored RED Aids (All Red Nun) shall indicate that side of a channel to be kept to the right (starboard side) of a watercraft when proceeding upstream or returning from the main water body. Go between all-red aid and a companion all-green aid. The red aid is used together with the all-green aid to mark the entrance of a channel. While traversing the remainder of said channel, all-red aids shall be kept on the same side of the watercraft as indicated by placement of aids at the entrance of the channel. 2. Safe water markers indicate that there is navigable water all around the marker. Their most frequent use is to indicate fairways or mid-channels. a. A RED and WHITE Vertically Striped Aid shall mark the Fairway or center of a channel. Watercraft can safely pass close by either side of these markers when following them in sequence. Stripes shall be of approximately equal width and marker shall display red spherical topmark. 3. Inland waters obstruction markers indicate that the hazard extends from the nearest point of land to the buoy. a. BLACK and WHITE Vertically STRIPED Aids shall mark obstructions extending from the nearest shore to the aid and shall indicate to a watercraft operator not to navigate between the aid and the nearest shore. The number of stripes is discretionary, provided the white stripes are twice the width of the black stripes. 4. Regulatory and Information Markers are used to alert the watercraft operator of the existence of dangerous areas, restricted or controlled areas, and which provide general information and directions. All regulatory waterway markers shall be colored white with orange color bands and symbols. Symbols (geometric shapes) shall be placed between horizontal colored bands of a marker body and shall be colored orange. a. A vertical open-faced diamond symbol to mean DANGER. The nature of the danger may be indicated by words and/or well-known abbreviations in black block letters above, below or beside the symbol in the white background. Some examples of words that may be used are: "Hazard Area," "Shallow Area," "Rock," or "Dam." b. A vertical open-faced diamond symbol having a cross centered within the diamond indicates that all motorboats are excluded from the marked area. All motorboats must KEEP OUT. The nature of the restriction may be indicated by words and/or well-known abbreviations in black block letters above, below, or beside the symbol in the white background. Some examples of words that may be used are: "Swim Area," "Water Intake," or "Area Closed." c. A circular symbol indicates that a watercraft operated in the marked area is subject to certain operating CONTROLS or RESTRICTIONS. The nature of the controls or restrictions shall be indicated by words, numerals, and/or well-known abbreviations in black block letters inside or beside the circle. Extra explanation may be given above, below, or beside the symbol in the white background. Some examples of words that may be used are: "Headway Speed Only," "Safety Slow Zone," or "No Ski." Note - Not all restricted or controlled areas are marked by buoys. d. A square or rectangular symbol to give INFORMATION or DIRECTIONS. The information shall be indicated by words and/or well-known abbreviations in black block letters above, below, beside or inside the symbol in the white background. In the interest of safety and uniformity, anyone placing any of the following types of waterway marking devices or waterborne structures in or on State waters must comply with State regulations. In addition, no object may be placed in State waters in a marked channel or a Fairway or in a manner that would impede access to a public boat launch facility or deny the right of Free Navigation. a. MOORING BUOYS: To avoid mistaking mooring buoys for aids to navigation or regulatory markers, they shall be colored white with a single BLUE horizontal band clearly visible above the water line. No mooring may be installed so that it or the object moored thereto extends beyond the water safety zone (200 feet from any shore) or one-third the distance to the opposite shore, whichever is less. c. FLOATS - SWIMMING AND DIVING: No such structure will be anchored or moored beyond the Water Safety Zone (200 feet from any shore), or one-third the distance to the opposite shore, whichever is less. d. SKI SLALOM COURSE, WATER: All water ski slalom courses shall be marked with RED and YELLOW, minimum nine (9) inch spherical markers and arranged in compliance with the American Water Ski Association Regulations for slalom courses. No part of a water ski slalom course shall be within the Water Safety Zone (within 200 feet of any shoreline) unless authorized to do so by the Maine Dept. of Inland Fisheries and Wildlife. e. SKI JUMP, WATER: All water ski jump structures will be equipped with orange reflectors or reflecting tape visible from all sides. Any such structure anchored beyond the water safety zone (200 feet from any shore) between the hours of sunset and sunrise, shall be illuminated with a single white light showing all around the horizon. f. REGATTA, WATERWAY PARADE, RACE AND/OR EXHIBITION MARKERS: Whoever wishes to hold or initiate an organized Regatta, Waterway Parade, Race or Exhibition on State waters must receive authorization to do so from the Maine Department of Inland Fisheries and Wildlife, Registration Information, Augusta, Maine 04333 and comply with the regulations contained herein for the specific type of marker or structure concerned. 1. Permanent Race Course Markers: Race Course markers shall be colored white with orange horizontal bands and display an orange colored triangular pennant. The alternate white and orange bands (white band uppermost) shall be of four (4) inch height, and that portion of a marker must extend a minimum of two (2) feet above the waters' surface. Pennants for these markers must be orange in color, triangular in shape. 2. Temporary Regatta, Waterway Parade, Race and/or Exhibition Markers: Any markers placed in, on, or near State waters incidental to an authorized Regatta, Waterway Parade, Race or Exhibition, shall comply with the following regulations: Markers shall be of the "Regulatory" type, with circular symbol indicating a controlled area, with proper wording affixed, i.e. Regatta Area, Parade Route, Boat Race, etc. The length of time these markers shall be permitted may not exceed forty-eight (48) hours prior to or following the scheduled event. All authorized races must use race course markers as depicted in the preceding paragraph. g. DIVERS' FLAGS or DIVERS' SIGNS: This Waterway marker shall, when displayed on the water, either from a float or watercraft, indicate the presence of diving activities in the immediate water area, and shall be displayed only when diving activities are actually in progress. Watercraft operators shall remain at least one hundred (100) feet from any diver's flag or sign and exercise every precaution while in the area. The diver's flag or sign shall be of a RED color with a WHITE diagonal stripe running from the upper left-hand corner to the lower right-hand corner (on a flag, from the mast head to the lower outside corner of the fly). h. BRIDGE CLEARANCE LIGHTS: where needed or desired on bridges, these shall be fixed (constant rather than flashing) RED lights marking the boundary or margin of each side of the channel, with a fixed single GREEN light placed over the center of the safe channel so as to indicate the maximum vertical clearance at that point. i. ORGANIZED CAMP PERIMETER MARKERS: may be utilized by organized camp owners in waters adjacent to their waterfront property. This waterway marker is used as a cautionary device to alert vessel operators of the camp's existence. Perimeter markers shall be a regulatory type marker, which indicates control or restriction. The word SLOW shall be printed within the circle symbol, ORG'D printed over the symbol and CAMP printed under the symbol. SEAPLANE LANDING AREAS OR MILFOIL AREAS. When marked shall be marked with SOLID YELLOW buoys. These markings have no significance as regards safe waters for the operation of watercraft, other than to inform the watercraft operator that seaplanes may be operating in the area or the existence of other special features. BAIT TRAPS: shall be WHITE in color and shall be identified as to ownership. From ice out to ice in; A baitfish trap buoy or baitfish holding box buoy placed or located within the inland waters of the State must be a minimum of four (4) inches in diameter and Twelve (12) inches in height and be covered with a reflective coating that is visible from all sides and covers a minimum of 25% of the visible surface area of the buoy. A. SIZE, SHAPE, MATERIAL AND CONSTRUCTION OF AIDS TO NAVIGATION AND WATERWAY MARKERS: the size, shape, material and construction of all markers, both fixed and floating, shall be such as to be observable under normal conditions of visibility at a distance such that the significance of the markers or aids will be recognizable before the observer is in danger. 1. Numbers, letters or words on an aid to navigation or regulatory marker shall be placed in a manner to enable them to be clearly visible to an approaching or passing watercraft. They shall be block style, well proportioned and as large as the available space permits. Numbers and letters on red or green backgrounds shall be white, numbers and letters on white backgrounds shall be black. All markers shall be conspicuously numbered for identification purposes. All numbers shall increase in an upstream direction or toward the head of navigation whenever this is reasonably definable (odd to left or port - even to right or starboard). On waterways where the head of navigation is not reasonably definable, marker numbers shall be assigned at the discretion of the Bureau and/or Permittee. 3. Numbers shall be required on all navigational aids or regulatory markers. For uniformity, this number shall be near the top of floating markers and in the lower right hand part of sign markers. Numbers shall be a minimum of two (2) inches in height. 4. A mooring buoy may bear ownership identification provided that the manner and placement of the identification does not detract from the meaning intended to be conveyed by the color code (scheme). C. REGULATORY MARKER SYMBOLS: The symbols (geometric shapes) displayed on a regulatory marker are intended to convey specific meaning to watercraft operators, whether or not they should stay well clear of the marker or may safely approach the marker in order to read any wording on the marker. Wording on regulatory markers shall be black in color. When a regulatory marker consists of a square or a rectangular-shaped sign displayed from a buoy or structure, the sign shall be white with an orange colored border. When a diamond or circular geometric shape is associated with the meaning of the marker, it shall be centered on the signboard. D. REGULATORY BUOY BANDS: Buoys used to display regulatory markers shall have a clearly visible orange colored band near the TOP and at the BOTTOM of the buoy. The bottom band should be visible above the buoys' waterline. The white portion between the bands will be used to display the appropriate symbol and wording, if any. E. REFLECTORS OR REFLECTIVE MATERIALS: shall be used on all navigational aids and regulatory markers. When used on markers having lateral (channel) significance, GREEN reflectors or retro-reflective materials shall be used on solid colored green markers; RED reflectors or retro-reflective materials shall be used on solid colored red markers; WHITE reflectors or retro-reflective materials shall be used for all other markers, except that orange reflectors or retro-reflective materials may be used on the orange portions of regulatory markers and yellow reflectors or retro-reflective materials may be used on all special purpose markers. F. LIGHTING OF AIDS TO NAVIGATION AND WATERWAY MARKERS: Navigational aids, when lighted, shall conform to the following: lights on solid colored markers shall be regularly flashing, regularly oscillating or equal interval lights. For ordinary purposes the frequency of flashes will not be more than 30 flashes per minute (slow flashing). When it is desired that lights have a distinct cautionary significance, as at sharp turns or sudden constrictions in the channel or to mark artificial or natural obstructions, the frequency of flashes may not be less than 60 flashes per minute (quick flashing). Colors of lights shall be GREEN light on solid colored green markers, a RED light on solid colored red markers and WHITE or AMBER lights for all other markers. G. SPECIAL LIGHTING REQUIREMENTS: Whenever a structure (anchored or stationary) is erected in a position on or adjacent to the edges of navigable channels or fairways or beyond the "Water Safety Zone" (200 feet from any shore), the Bureau may require lights to mark such structures when, in its judgment, lights are necessary for the safety of the boating public. A. AUTHORIZATION: To place any navigational aid or regulatory marker on, in, or near waters of this State, written authorization must first be obtained through the Maine Department of Agriculture, Conservation and Forestry, Bureau of Parks and Lands, under its State Permit System. The provisions of the above paragraph shall not apply to aids to navigation under the jurisdiction of the United States Coast Guard, nor to those aids and markers which come under the political subdivision paragraphs of this section. B. POLITICAL SUBDIVISION AUTHORITY: Title 12 MRSA Section 1894; If the Bureau of Parks and Lands , after written request from the governing body of any city or town, either declines to mark a waterway or is unable to mark a waterway, then the governing body of the city or town may mark hazards to boating on that waterway within its jurisdiction. The Bureau of Parks and Lands shall be deemed to have declined to mark a particular waterway if the Bureau does not respond to a written request within thirty (30) days of its receipt. The Bureau of Parks and Lands may at any time reverse a decision not to mark a certain waterway or portion of that waterway and replace any existing markings in accordance with the rules of uniform marking promulgated by the Bureau. C. PRIVATE PERMITTED NAVIGATIONAL AIDS AND REGULATORY MARKERS: A Lake Association, organization or political subdivision may be authorized by State Permit to construct, place, and maintain aids to navigation and/or regulatory markers in/on State waters. 2. All markers must conform to the Maine State Aids To Navigation System Rules and Regulations; Regulations governing specific markers can be found in Section III and IV of these Regulations. 3. Inspection - All permitted waterway markers shall be maintained in proper condition and location, or be replaced or removed. The organization shall inspect the location and condition of markers regularly, at least every three (3) weeks, to assure they are in position, and keep a record of these verifications. Failure to keep written verifications shall be sufficient reason for the cancellation of this permit and removal of markers. D. LIABILITY: Title 14 MRSA Section 159-C; Liability related to placement of navigational aids in great ponds. A lake association that has obtained a permit from the Department of Agriculture, Conservation and Forestry to place navigational aid markers in great ponds is not liable for personal injury, property damage or death caused by placement or maintenance of those navigational aid markers, provided that the lake association has placed or maintained the markers in conformance with the terms and conditions of the permit. 1. "Lake Association" means a nonprofit organization incorporated under state law whose corporate purpose includes maintenance or improvement of water quality or public safety on a great pond, management of water levels or other social, educational, stewardship or advocacy efforts to benefit users of or the natural environment of a great pond. 2. No remuneration - In order to qualify for the immunity, a lake association may not receive any remuneration from the State or otherwise for placing navigational aid markers in great ponds. 3. Limitations - This section does not limit any liability that may otherwise exist for willful or malicious actions or failures to guard or warn against a known dangerous condition related to the navigational aid markers. 4. No duty created - Nothing in this section creates a duty of care or ground for liability. 5. Cost and fees - The court may award any direct legal costs, including reasonable attorney's fees, to a lake association against which a tort or related action is brought when the lake association is found not liable pursuant to this action. Any water utility or municipality is authorized, after consultation with the Commissioner of Inland Fisheries and Wildlife, the Department of Human Services, Drinking Water Program, and the Department of Agriculture, Conservation and Forestry and after conducting a public hearing in the affected town, to designate by buoys in water or markers on the ice in an area on a lake or pond from which water is taken, with a radius commencing at its point of intake. The radius may not exceed 400 feet and within that area a person may not anchor or moor a boat or carry on ice fishing or carry on any other activity designated by the water utility or municipality when such restriction is necessary to comply with the primary or secondary drinking water regulations applicable to public water systems. Any such buoys placed in the water must be plainly marked as required by the Director of the Bureau of Parks and Lands under Title 12 MRSA, Section 1894. Any person violating this section must, on conviction, be penalized in accordance with Title 30-A, section 4452. Buoys for this purpose shall be regulatory in type, display a vertical open faced diamond symbol having a cross centered within the diamond, and the words "Area Closed" printed in the Display Area. DON'T BE A LITTER BOAT! No person shall throw, drop, deposit, discard or otherwise dispose of litter in any manner or amount: in or on any public highway, road, street, alley, public right-of-way or other public lands, except in containers, receptacles, or on property that is designated for disposal of garbage and refuse; or in any fresh water lake, river, or stream, tidal or coastal water or on the ice over the water. When litter is thrown or discarded from a watercraft both the operator of the watercraft, unless it is a watercraft being used for the carriage of passengers for hire, and the person actually disposing of the litter are in violation of this section. This subsection does not prohibit persons who fish, lobster, or otherwise harvest from the water from returning to the water harvested products, bait, and similar materials that naturally originate in the water. Please report any buoy that is found damaged or off station as soon as possible to the Maine Bureau of Parks and Lands, Navigational Aids Program, Richmond, Maine Telephone: (207) 582-5771. To receive a copy of "State Aids to Navigation System" contact us at (207) 582-5771 with your name and address.